All blankets are 54 X 75 inches, all products made in the USA - by the Best Little Weighted Blanket Company in Texas. The double sized blankets are available up to 25 lbs. The double sized weighted blankets are made from 100% cotton fabrics. Many couples both enjoy the weight of a weighted blanket! Some single folks want the weight of an extra large blanket for better sleep and downtime/relaxation. The engineering of our the weighted couples blanket is to get the weight on the person or couple in the bed that is why the weight is focused on the 54 inches across, and isn't cut to cover the sides of the bed. 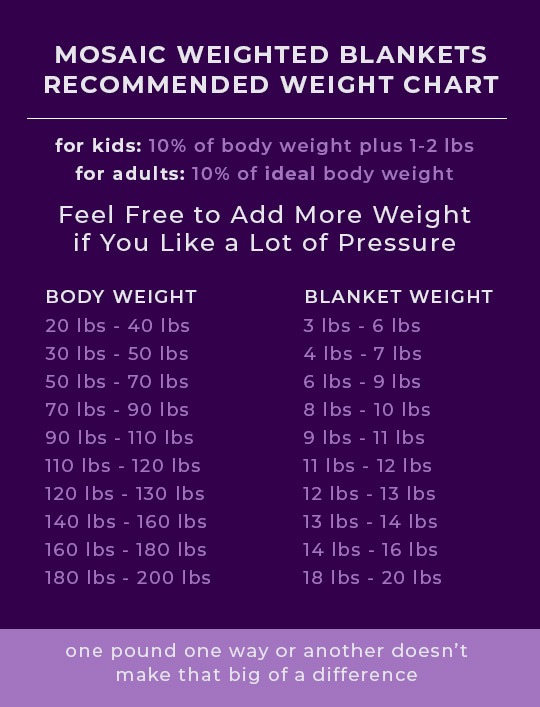 The more weight is on the person, the more therapeutic the blanket for sleep and downtime. Unlike a bedspread, you do not want the weighted blanket to cover the bed down the sides, it needs to fit on the bed directly to provide solid weighted therapy. We use commercial grade polypellets and high cotton comfortable fabric, polyfil to construct our blankets. Shipping costs determined at checkout based on customer's address. The Full/Double weighted blanket may be available in the listed solid fabrics only. Shipping costs to be determined at checkout based on customer's address.